– The Annapolis Capital is reporting that three members of the Navy football team have left the school. They are Center Dale Howard, Fullback Mike Patrick, and linebacker Jarvis Cummings. All three were back-ups on the depth chart, with Howard and Cummings listed as #2 at their positions, while Patrick was 3rd string. While this doesn’t hit the top-line, it certainly undermines depth at those positions. – Navy Women’s Lacrosse team captain Kierstin King has been selected to play in the IWLCA Senior All-Star Game on June 16th. She joins two other players from the Patriot League, Lehigh’s Leigh Ann Torcivia and Colgate’s Courtney Miller. – The Big East is looking towards the Poinsettia Bowl for possible western expansion of their bowl game tie-ins starting in 2014. Their current bowl inventory does not reach the Mississippi River, with the westernmost bowl game being the BBVA Compass Bowl in Birmingham, Alabama. The MWC has an agreement with the Poinsettia Bowl that expires in 2013. With Navy scheduled to play in the bowl game in 2014 (if bowl eligible), such a match-up could give us a preview of league play in 2015. – The demo for NCAA Football 13 has hit the PS3 and Xbox 360. While this normally wouldn’t be huge news for our blog, there’s a hook. 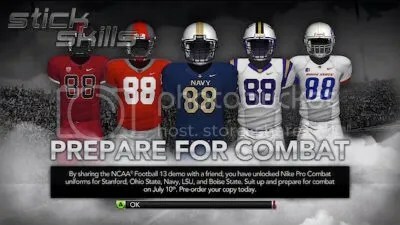 Users who share the demo with friends will unlock Nike Pro Combat uniforms for five teams: Ohio Shate, LSU, Boise State, Stanford and…wait for it…Navy. That’s not bad company to keep. No word yet if there is a combat coaching mode for Air Force fans.